1. Living together is no guarantee of commitment. A study by Pollard and Harris (2013) found that 41% of cohabiting men were not ‘completely committed’ to their live-in girlfriends. 2. That’s hardly surprising if you consider that cohabitation provides men with all the desirable benefits of companionship, without the potential risks of marriage. 3. 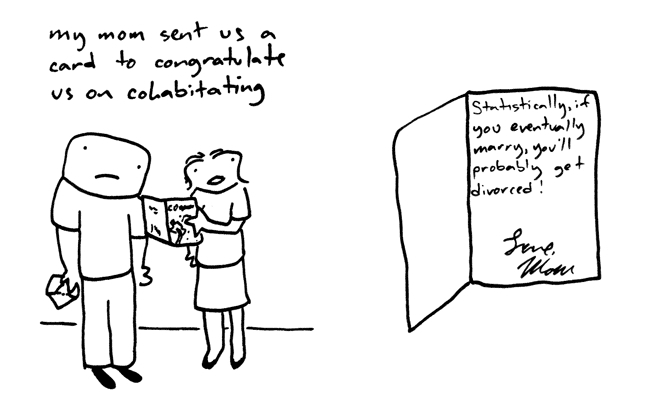 A significant number of men report that they won’t marry their cohabiting partner because they don’t think she is their ‘soul-mate’ (Whitehead and Popenoe, 2002). 5. Cohabiting relationships often last a lot longer than they should because, according to ‘inertia theory’, constraints such as mortgages, cats, kids, Ikea sofas, or indeed, 20,000 euro stipends and offices in the presidential palace, make cohabiting relationships more complicated to terminate. 6. After five years, 49% of cohabiting relationships are over compared to 20% of marriages. After 10 years 62% of cohabitees have called time on their relationship compared to 33% of married couples (CDC 2002). 7. And couples who live together before tying the knot are more likely to get divorced than their counterparts who don’t move in together until they are engaged or married. (Rhoades 2006). 9. Half of people (51%) in the UK still falsely believe that cohabiting couples have rights as ‘common law’ spouses. Only 38% know that common law marriage does not exist. 10. In the UK when a cohabiting relationship ends, neither partner has a legal duty to support the other financially. If your partner is the sole owner of the property you live in, you may have no rights to remain in the home if you are asked to leave. In France unmarried cohabitants can enter into a civil union contract known as a PACS which gives both partners more security. Lets hope Valérie got François to sign one.